After Donald Trump and Mike Pence spent the bulk of 2016 insisting that Hillary Clinton was disqualified from the race due to her use of private email, even after the FBI Director had already fully exonerated her on the matter, one might expect the Trump-Pence administration to make a point of being open about their own email usage. But instead it turns out Pence is now embroiled in an email controversy so vast that it’s following him from Indiana to Washington DC. 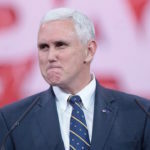 The current email controversy stems from when Mike Pence used his role as the Governor of Indiana in 2014 to bizarrely sue the Obama administration over its immigration policy. Pence hired a private law firm to handle that lawsuit and made the taxpayers in the state pick up the legal tab. But now he’s arguing that the emails he exchanged with that attorney should remain private, as reported by the Washington Post, even as a judge in the state prepares to release them. Pence is fighting tooth and nail this week to keep those emails from being made public. Because the attorney was working on behalf of the state and not on behalf of Pence, typical attorney-client privilege doesn’t apply in this instance. While no one knows precisely what Mike Pence is trying to hide in the emails he exchanged with the attorney, the dishonestly partisan nature of the Governor of Indiana suing the President over something as far-removed as immigration, and Pence’s great effort to prevent the emails being released, suggest that whatever he’s hiding is explosive. Is it enough to prevent him from being able to take office as Vice President of the United States in January? Only Mike Pence knows the answer to that. But the manner in which he’s making a priority of fighting to keep these emails private, at a time when he’s supposed to be leading the Trump transition in Washington DC, is raising eyebrows.